Hello everyone! I am thrilled to be participating again in the Leukemia & Lymphoma Society (LLS) Light The Night Walks - this being my 7th year with Team Zavadowski. When I first heard of their remarkable story [along with so many other stories] in their fight against blood cancers, I just had to get involved and join in the cause! But this year will be an emotional walk for me - for I will be walking in memory of my paternal grandmother, Gloria C Gallant. She was diagnosed with acute myeloid leukemia (AML) last year in June, shortly after her 90th birthday - and after a courgaeous six-month battle, passed away from the disease shortly before the holidays in December. Always the active type and refusing to let the news that she had cancer get her down, my grandmother and other family members sought suitable treatment after her initial diagnosis. After visiting the Leukemia Center at Mass General Hospital in Boston (where additional tests confirmed she had AML), she was encouraged to undergo hypo-methylating treatment. This form of treatment disrupts the replication of abnormal white blood cells in the bone marrow so the body can produce normal cells. This therapy is among the many treatments that have been approved in recent years thanks to research and funding by LLS. 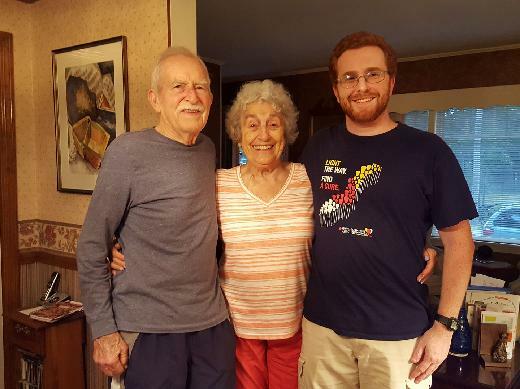 My grandmother underwent four rounds (every 28 days) of treatment up until October, as well as made regular visits to Mass General for further tests to assess the effectiveness of the treatments. Like many cancer patients, she experienced fatigue and tried to avoid becoming anemic. She had several blood transfusions for low red blood cell counts. On balance, she responded well to the treatments and did her best to remain physically active every day. Her motto of "waking up every day with a purpose" enabled her to maintain a positive outlook. She had been showing good progress, in the hope that she would have eventually defeated the disease. But unfortunately, she suffered a stroke in November, which in turn threw off the treatments. As disheartening as the news was to me that she would succumb to AML, my grandmother continued to stick to her motto and remained incredibly strong and confident every day. She spent her final days peacefully and surrounded by our loving extended family, in celebration of a life enjoyed to the fullest! I think of Grams often - she had an incredible spirit that is greatly missed! She is also inspiring for being physically active and involved in her community before and after the AML diagnosis - she would not let cancer deter or defeat her! So I'm walking and fundraising again this year to pay tribute to her, as well as bring hope to the countless others who are currently battling blood cancers! Please consider making a donation in support of this live-saving cause! Please click on "Donate Now" if you want to make a donation. ANY amount makes a difference, and you'll join hundreds of thousands of people supporting this all-important event! OR, if you'd like to join Team Zavadowski for the LTN Walk on October 20th in Washington, D.C. and be part of a special team, click "WALK WITH US" at the top of the page! Please make a donation to support my participation in the Light The Night Walk and help save lives. Be sure to check my Web site frequently to see the team's progress, and thanks for your support!